I’ve always thought that super combs that were in the hive when Apiguard was on were contaminated, and shouldn’t be reused. Another beekeeper locally reckons that it’s ok to reuse them if the bees have cleaned them up. I’d like to believe him, as I’ve got three supers full of lovely drawn comb, and bees that are filling supers at a rate of knots! Any opinions will be gratefully received! 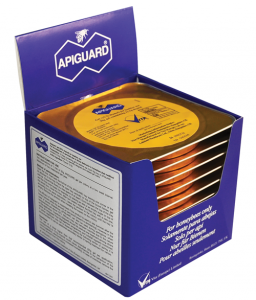 Rather than “contaminate” combs, it’s more accurate to say that Apiguard can “taint” honey stored in combs present on the hive when an Apiguard treatment is applied. If you applied Apiguard last year, the tainting, if there is any, is likely to be very small and probably negligible or non-existent with the passage of time, especially if the bees have cleaned out the combs. The tainting, if there is any, is unlikely to affect empty wax comb to any real extent. Previously used super combs should be perfectly OK to reuse. There MAY be a slight risk of thymol in the wax but a very low risk and should not affect the honey at all. There is an Apiguard FAQ and a video about how to apply Apiguard.